February 24, 2015, Rybinsk. 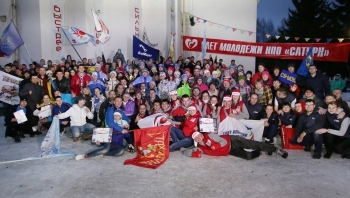 - A holiday of sport, intellect and creativity organized by NPO Saturn was held on 21-23 February in Rybinsk. The 29th (winter) youth gathering dedicated to the year of literature in Russia took place at the Black River resort. In the course of three days the engineers from Rybinsk, Perm (PMZ), Moscow (Salut) and Komsomolsk-upon-Amur (the Sukhoi Company) were competing and trying to be as creative as possible. February 24, 2015, Rybinsk. - NPO Saturn played host to a visit of Marcos Pinotti, a professor, member of the administrative council of the Federal university of Minas Gerais (UFMG, Brazil) and Evgeniya Shamis, general director of Sherpa S Pro (Moscow, Russia) and advisor to the vice-governor of the Samara Region. Marcos Pinotti ranks among the top 100 world scientists in the field of bioengineering and bionics and is the author of the biggest number of patents in Brazil; he is also advisor to the office of the president of Brazil for technological development, member of the Brazil-U.S.A. council for the future of engineering and president of the Latin-American society for biomaterials. Together with Evgeniya Shamis they founded the International Workshop “Innovations and Clusters” (Brazil). February 19, 2015, Rybinsk. - In the frame of the activity of the Rostec State Corporation focused on the design of UAV-based complexes and development of modern technologies for their manufacture, a project utilizing additive technologies is currently underway. NPO Saturn has played an active role in the project elaboration and designing of the said unmanned aerial vehicle. February 17, 2015, Rybinsk. 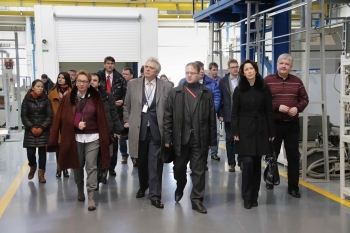 - NPO Saturn hosted a visit of the representatives of the Russian Venture Company (RVC). The purpose of the visit was to establish a partnership for solving the tasks posed to the company today using the tools and expertise of RVC. February 13, 2015, Rybinsk. - A special status of a design engineer’s profession and the importance of continuity between generations in such a high-tech industry as aircraft engine manufacturing were the highlights in a series of events hosted by NPO Saturn in Rybinsk on 12 February 2015. February 3, 2015, Rybinsk. 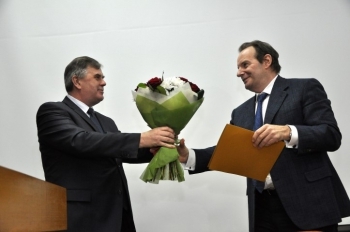 - The governor of the Yaroslavl Region visited NPO Saturn and took part in a meeting dedicated to summarizing the company’s results demonstrated in 2014 and discussing the prospects with regard to NPO Saturn’s main fields of activity in 2015. The governor gave a high appraisal of NPO Saturn’s main indicators for 2014. The production volume in 2014 amounted to RUB 18 billion. The year-on-year increase demonstrated by the Rybinsk-based site was 20%.